The Secord Wetland natural area is a 4.4 hectare site located in the Lewis Farms area and consists of a wetland surrounded by an upland forest dominated by balsam poplar. This natural area is a remnant patch of the formerly larger Winterburn School natural area. The presence of both a treed upland area and a low-lying wetland allows for some different functions and values that would not exist if only one of the two features was present. These additional functions include providing habitat for animals that require elements of both wetlands and forests, such as goldeneye ducks and frogs. The complex also acts as a buffer and a filter that stabilizes the wetland. 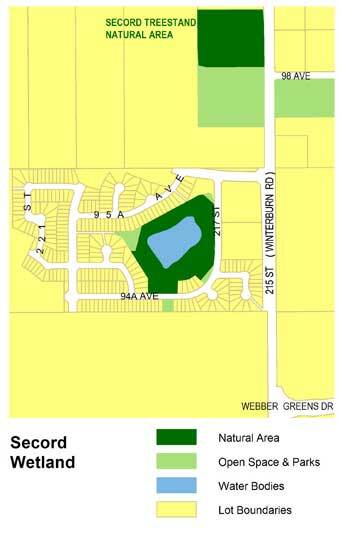 Located in the east portion of the Secord Neighbourhood, the Secord Wetland can be accessed from 217 St. 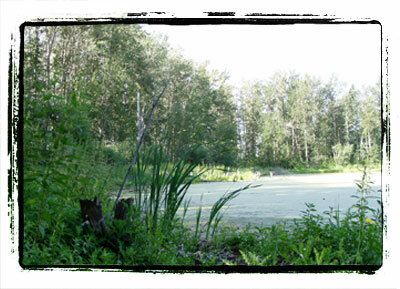 Parking is available along many of the local roadways and a formal trail extends from 217 St. along the southern portion of the natural area to 94A Ave. Benches and signage are also provided along this route and the wetland can be viewed from a number of locations. Future plans include providing walking trails around the west, south and east sides of the natural area. Many bird species such as pileated woodpeckers, other insectivores, and waterfowl utilize the natural area. Other species that may be encountered at the Secord Wetland natural area include white-tailed deer, fox, coyote, small mammals, and amphibians. The natural area also supports a diverse vegetative community containing both aquatic and upland species.